Come experience our great Northwest Nebraska mule/whitetail deer hunting, located on our private game rich property. We are one in few states that still allow “Over-the-counter tags”, with no complicated draw system. We offer you a chance at harvesting our deer population with bow, rifle, and muzzleloader packaged hunts. These hunts can be semi-guided or fully-guided hunts. We try to focus our business on repeat clients, so booking your hunt early can help guarantee a slot. Please be sure to call for pricing and “Let Our Experience Meet Your Needs”. Oldaker Outfitting provides deer hunts in the beautiful Pine Ridge of Sioux and Dawes County Nebraska where the population is strong and the animals are mature and healthy. Oldaker Outfitting, LLC leases and owns 35,000 privately owned acres, which gives our clients a great opportunity to see many types of trophy class bucks across many types of challenging terrain. We allow our clients or group ample opportunity to hunt where the deer population has been scouted by our guides prior to your arrival. The deer herds on our land are approximately 50% mule deer to 50% whitetail. Mule deer bucks seen on our property can range from a 130-class to 180-plus buck. Whitetail bucks range from 120-class to 170-plus bucks. All of our land has been well managed with good genetics allowing trophy class game to be seen, and harvested year after year. This is a fair chase, free ranging, wild deer hunt. Our deer are not fenced in or shot under bait traps. If you like the thrill of the chase then this is for you. We have no control over our wildlife, weather, Mother Nature, and acts of God. Our crew hopes to provide you with an experience to remember for a lifetime and the making of a long lasting friendship. - The pending Nebraska muzzleloader, all time non-typical mule deer state record was harvested on our property in 2007. This buck scored 212 ½ inches. - The possible new Nebraska rifle, all time typical mule deer state record was also harvested on our property in 2005. This buck scored 203 inches, and has not yet been entered in the Nebraska record books. Semi-guided archery Buck hunts include: (5) full days of hunting with (6) free nights of lodging, as well as pre-season scouting, confirmed locations of deer populations, rut zones, travel corridors, blinds, and tree stands set ups, and feeding areas prior to your arrival. This allows you to begin hunting immediately! Meals can be included with this type of hunt package for an additional price. - During the earlier part of our archery season the deer populations seem to double in numbers. 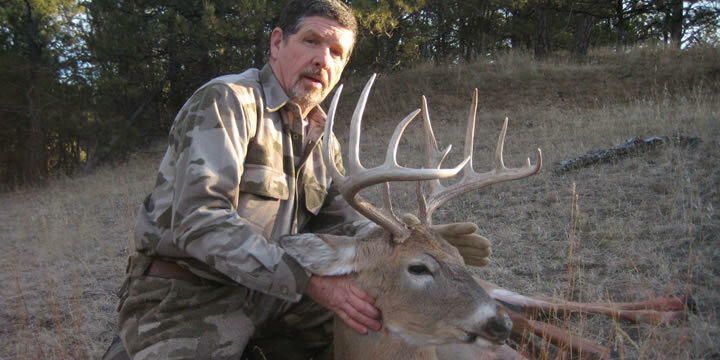 We have been noticing large numbers of trophy size deer coming in from the Wyoming, and South Dakota borders. The Wyoming and South Dakota hunting seasons benefit us by providing us more quality trophy deer coming in from many different travel corridors on our property lines. - Fast shooting bows, and draw weights you can hold and shoot a great accuracy with, is what we recommend. - Most archery shots are 15 to 60-plus yards. Fully-guided rifle/muzzleloader Buck hunts include: (4) full days of hunting with (5) free nights of lodging, as well as, meals/snacks, 1 guide on 3 to 4 hunter guiding, harvested game care, pre-season scouting, transportation, and already placed blinds and tree stands. Semi-guided rifle/muzzleloader/archery Doe hunts include: (1) day hunt, as well as pre-season scouting, confirmed locations of doe populations, travel corridors, blinds, and tree stands set ups, and feeding areas prior to your arrival. This allows you to begin hunting immediately! Meals can be included with this type of hunt package for an additional price. - These hunts are maneuvered by spot and stalk methods, as well as some tree stand and ground blind techniques. - Deer Rifle, Muzzleloader, and Archery seasons are during some very strong “Ruts” with bucks on the move to make for more exciting hunting action. Each season has at least one rut time each and every year. - Rifle shots are 50 to 300-plus yards, and muzzleloader shots are 20 to 150-plus yards. Please let us know what type of weapon you plan on bringing for your hunt experience. “Not included with deer hunt packages”: No hunting licenses or permits, meat processing, taxidermy, shipping cost, airline tickets, transportation from or to your living location, gratuities towards the cook/guide. Non-Resident: Nebraska deer hunting permit are $209 each, plus $16 habitat stamp. Non-Resident: Nebraska antlerless-only permit are $55. Resident: Nebraska deer hunting permit $30 each. Non-hunters are always welcome, call for current pricing. Permits can be purchased online and printed out on the Nebraska Game and Parks website at www.outdoornebraska.org.